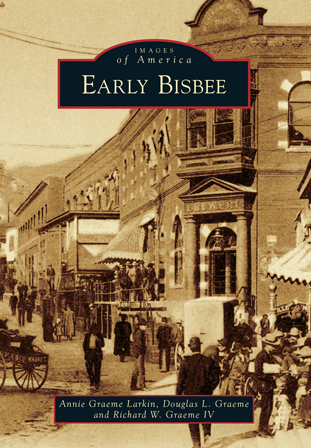 Before Bisbee became a bustling mining camp, it was a haven to Native Americans for centuries. However, their presence brought the intrusion of army scouts and prospectors into the Mule Mountains. The coincidental discovery of vast mineral wealth at the future site of Bisbee permanently affixed the fate of the land forever. Rising from the remote desert was a dynamic mining city, a city that grew into one of the most influential communities in the West. Bisbee was unique in the Old West because of the mixed moral values. High society and the decadent underworld lived in a delicate balance, but a vibrant multicultural community was forged from these social fires. The Graeme family's ancestors arrived in Bisbee in 1883. Five generations of the family have continued to live and work in the community, including siblings Annie Graeme Larkin, Douglas L. Graeme, and Richard W. Graeme IV. With their deep roots in the community, the family strives to preserve multiple facets of Bisbee's past, including images and minerals. Presently, Annie Graeme Larkin is the curator of the Bisbee Mining & Historical Museum, Douglas L. Graeme is the manager of the Queen Mine Tours in Bisbee, and Richard W. Graeme IV is a science teacher at Joyce Clark Middle School in Sierra Vista, Arizona.